If you have earlobes that have been torn or stretched from heavy earrings or misplaced piercings, we can help you. 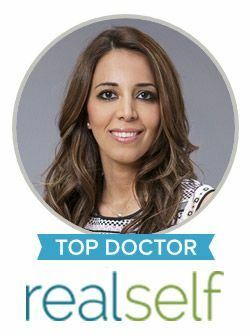 Dr. Sanaz Harirchian is a highly respected facial plastic surgeon with specialized training in cosmetic and reconstructive ear surgery. Torn earlobe repair is a straightforward and minimally invasive procedure that can be performed on an outpatient basis using local anesthesia. The earlobes are solely compromised of cartilage, which makes this area of the ear more vulnerable to damage or deformity. In the majority of cases, prolonged wear of heavy earrings cause the earlobe to stretch and eventually tear in some patients. The earlobes may also become torn or shapeless due to piercings that are too close to the bottom of the lobe, multiple piercings or even the natural aging process. While torn or stretched earlobes may not produce discomfort, it can be a notable cosmetic concern for many individuals. Some women may no longer be able to wear earrings due to their damaged earlobes. Dr. Harirchian is exceptionally equipped to repair your torn earlobe and restore your earlobe to its most natural shape and form. This minimally invasive procedure can be done quickly and typically involves no downtime or scarring. Dr. Harirchian can also repair earlobes that are misshapen, asymmetrical or plagued by keloid scars. Your surgical plan will be tailored to your unique concerns and needs. To schedule your torn earlobe repair with Houston’s most trusted ear plastic surgeon, please contact our office today. Through patient-centered care and distinguished expertise, we create a highly rewarding experience in facial plastic surgery.